The Springs in Fall — 2015 Photos #25: Colorado Cookery II, or “Snacks and a Plane” « Midlife Crisis Crossover! Usually when an airplane is lodged halfway inside a building, it’s called a disaster. The Airplane Restaurant proves they can achieve peaceful symbiosis. 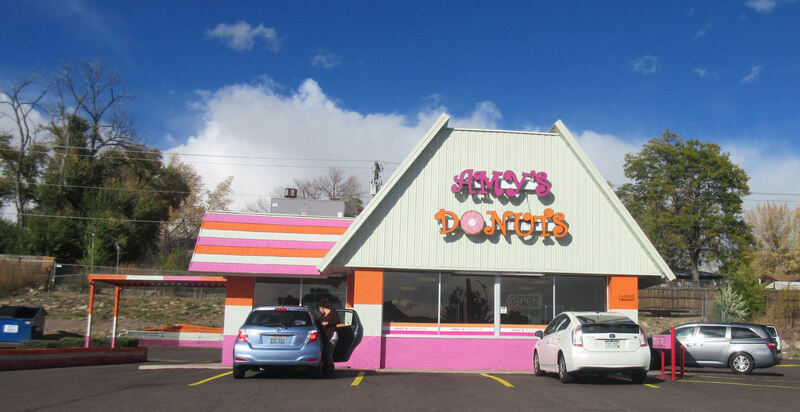 As with our July road trip to the South, I was determined to find places to eat in Colorado Springs that we didn’t have back home in Indianapolis. Here we backtrack a bit to recap a couple of culinary experiences we had in the margins between the last several chapters in this series. Not all of them were trendsetting, but two of them were more creative than anyplace I’ve seen in Indianapolis. For one of those establishments, the creativity was in the structure itself. Pictured above is my lunch option for Day 5 — the Airplane Restaurant, a perfect companion to the National Museum of WWII Aviation down the street. 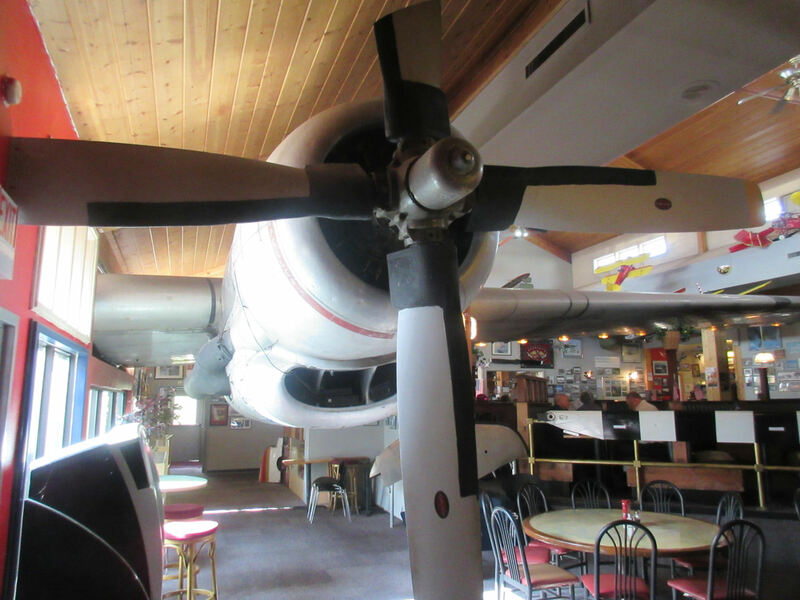 This 13-year-old eatery is attached to a Radisson Hotel, housed partly inside a normal building, and partly inside a Boeing KC-97. Once a refueling tanker for other planes, now it refuels people. This was quite a difference shape from lunch on Day Four. 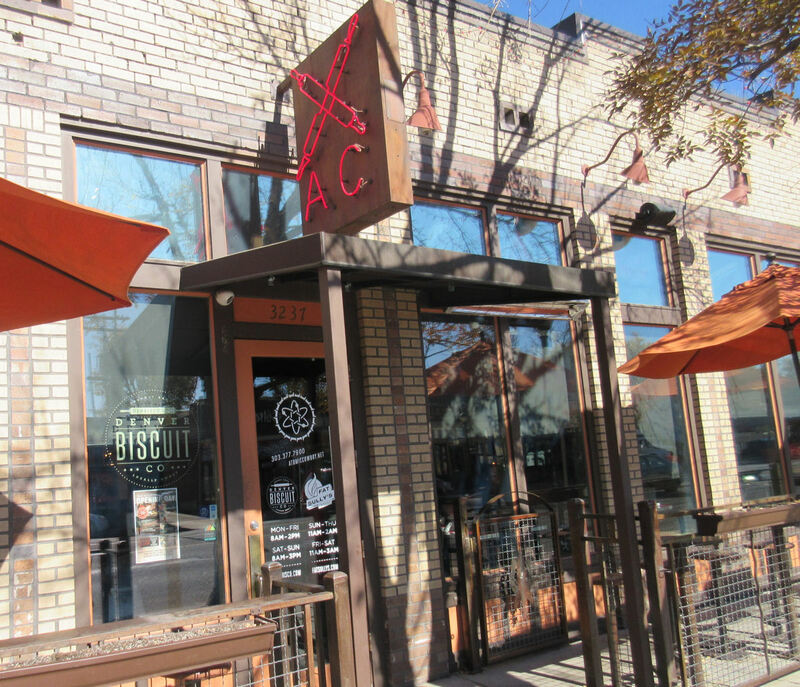 As previously recounted, for lunch on Day Four I’d driven up to the Denver Biscuit Company to meet an old friend. ‘Twas a tiny place with three identities and a lot of character. At lunch time, it doubles as Fat Sully’s Pizza. At night, it becomes the Atomic Cowboy. It’s like the Moon Knight of restaurants. 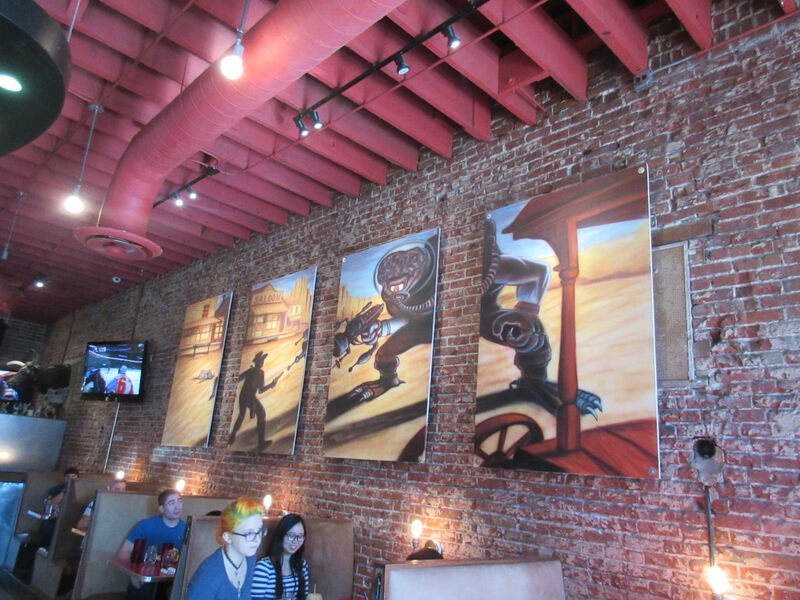 When we walked inside and I saw this cowboy-vs.-alien quadriptych, I knew he’d chosen wisely. This place really spoke to me. 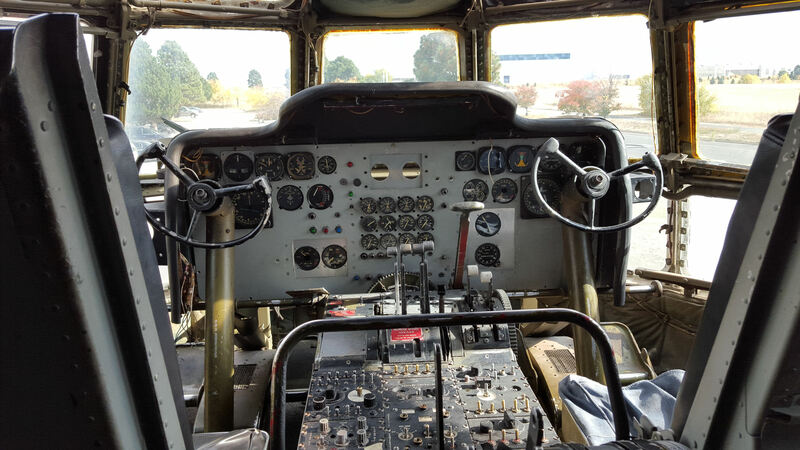 By contrast, the Airplane contains several collections of airplane-related documents and artifacts. Greatest of them all: the left wing and propeller of that Boeing, trimmed slightly to fit the space allotted. Sorry, kids, your waitress will not fire it up for a test drive, no matter how nicely you ask. 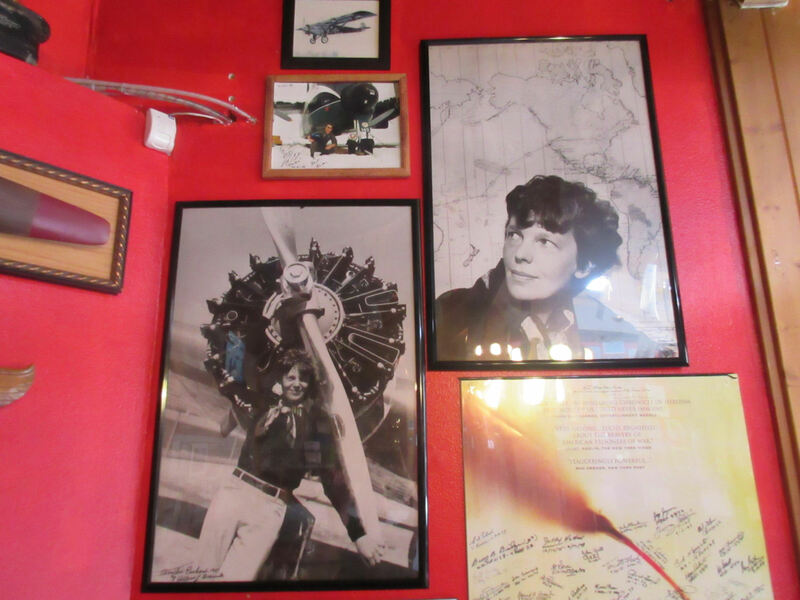 The Amelia Earhart section was of particular interest to my wife, who sadly had to enjoy this image in absentia after she got off work. I’m told her family has some sort of distant connection to Earhart’s. My sister-in-law has the printouts somewhere. 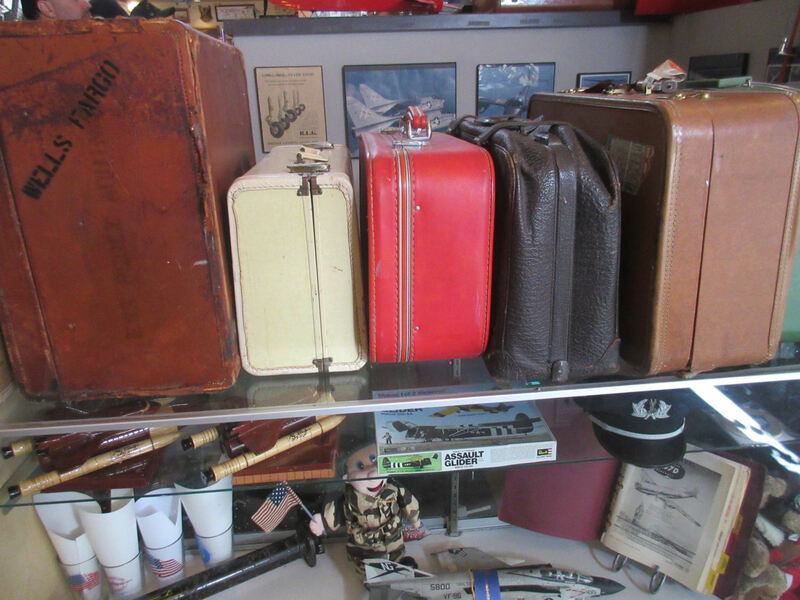 If you’ve been missing any luggage from the past several decades, you might want to check out this helpful baggage claim display and see if anything looks familiar. 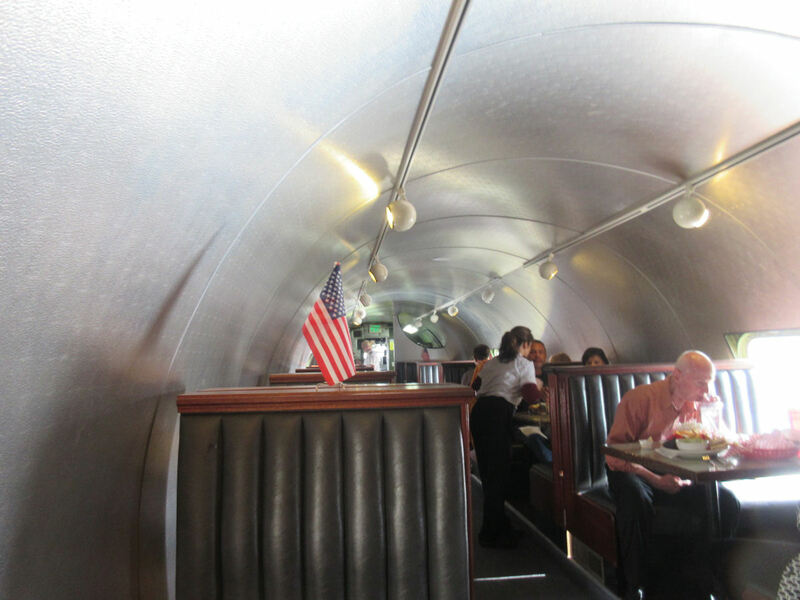 Diners have the choice of eating either in the mundane dining room or up inside the airplane itself. The fuselage space felt a bit cramped and you can hear other conversations clearly reverberating off the hull, but obviously I wasn’t here for the mundane. One party offscreen to my right was clearly ex-military, but mostly they were discussing boring stuff like golf, so I didn’t bother to take notes. Diners are welcome to explore the exhibits and the rest of the plane itself while waiting on food. Even the cockpit is fair game and intact. Alas, no one was on duty to hand out free pilot pins to kids. By this time in the week I found myself growing increasingly budget-conscious, because a bonus vacation isn’t something we do every year, and I didn’t have a per diem like my wife did. 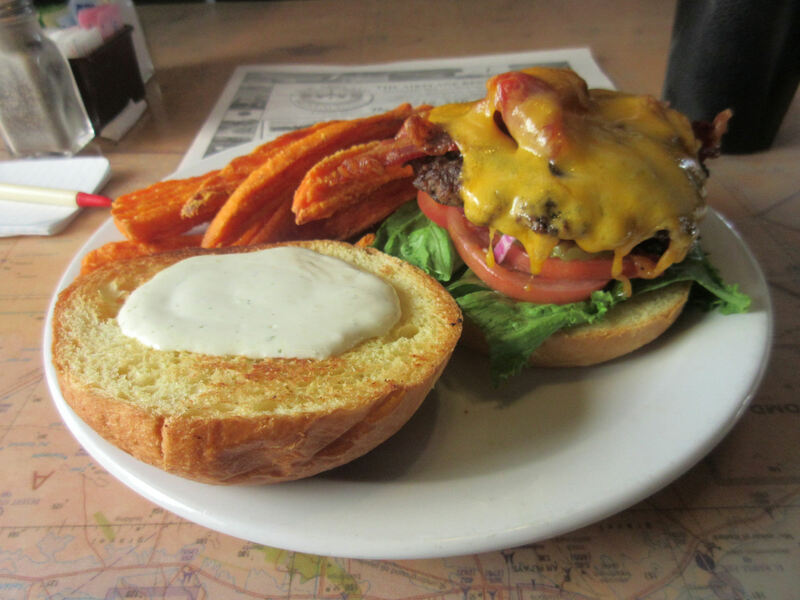 My lunch was their BBQ Bomber Burger — topped with barbecue sauce, hickory-smoked bacon, and ranch dressing, plus a side order of sweet potato sticky fries. The burger was what it needed to be; the fries, not cooked as well as I’d’ve liked. But they weren’t meant to be the star of the dish or my day anyway. Not pictured at all in this series: our Day Four dinner at Il Vicino, a small Southwest pizza chain with nine locations in Colorado, New Mexico, and Kansas. My wife and I hung out there with her boss, who was also in Colorado Springs for the week. Per his strict orders, we talked about anything but work. While they each did their thing, I ordered the Bianco — topped wit capocollo ham; spicy oil; mozzarella, gorgonzola, and goat cheese, mushrooms, onions, tomatoes, and rosemary. I had them add pine nuts and anchovies just for kicks. Anchovies are another one of those alienating ingredients that I like but never get to have because I’m never around anyone who likes them. I was fine with my choices. 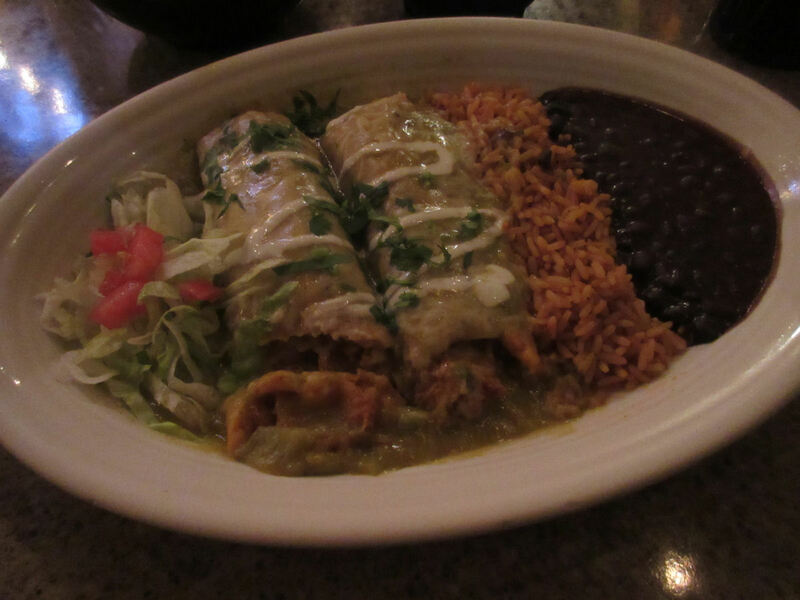 As for dinner on Day Five, we tackled another local food category we had yet to address: Tex-Mex! So much closer to both Texas and Mexico than usual, and yet it hadn’t occurred to us till near the end of our stay. 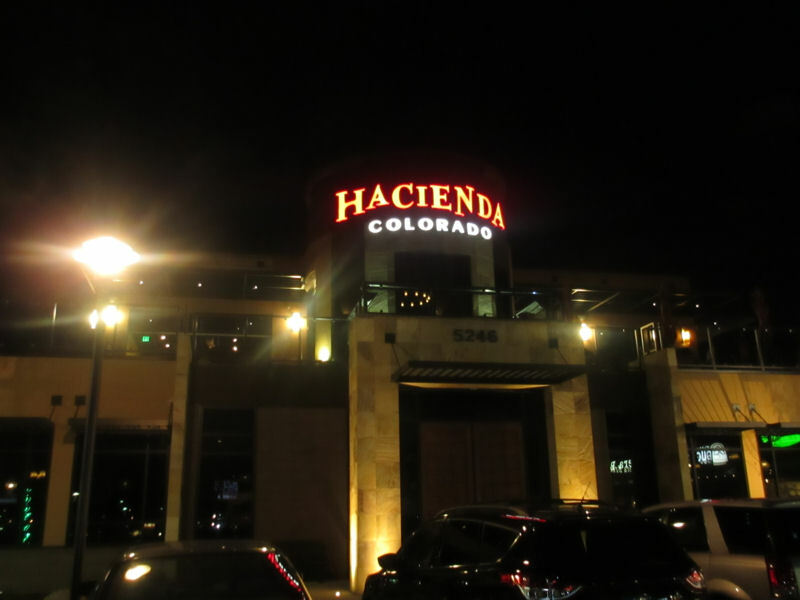 Not far from our hotel was Hacienda Colorado, another small chain with five locations, this particular one being a relative newcomer opened in 2014. Their current slogan: “Mexican Food with Altitude”. I trust you see what they did there. I admit I get extra excited whenever I see a menu containing words we only hear on Chopped. I’m kind of an uncultured rube like that. Presented for my education and consumption: Carnitas Tamales — pork carnitas wrapped in handmade masa, served with red mole and roasted jalapeno sauce. Meanwhile, Anne settled for “Hacienda-style” steak tacos. And that’s okay. 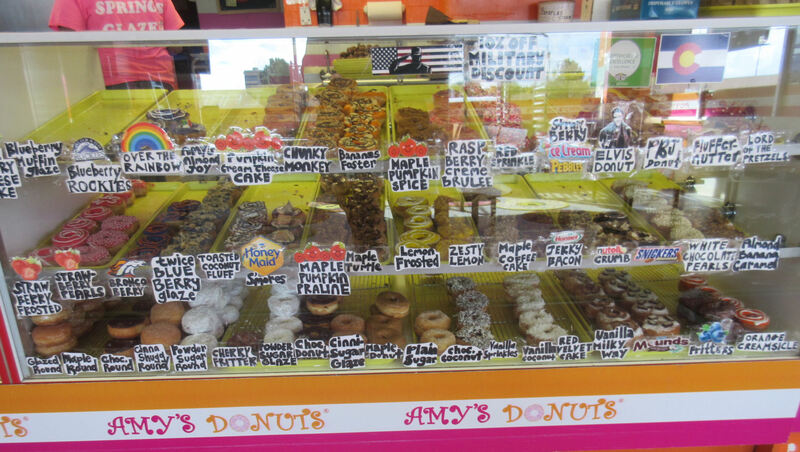 However, the greatest food of Day Five arrived in the middle of the day during when I swung by Amy’s Donuts, whose specialty is self-explanatory. Right now there’s just the one, but their benevolent brain trust is presently planning new locations in Tucson and Columbus, Ohio. Absolutely positively no relation whatsoever to the notorious Amy’s Baking Company, located way the heck over in some other, unfortunate southwest state. We previously showed you the six donuts I selected after several long minutes of painstaking deliberation. That was maybe 1% of the available options. Behold the magical worlds of Amy’s. This was less than half their displays. Your move, Dunkin. Not pictured: their wide selection of cake donuts, which I usually can’t stand, and the options containing meat, which were down on the far end. Junk-food aficionados with dietary restrictions should note they have no vegan or gluten-free options at this time. Residents of the 47 states and hundreds of countries without imminent Amy’s access should note they’re unable to offer mail-order goodies at this time. They may not be pleasing all of the people all of the time, but if we’re ever in the area again, I’m considering having breakfast there a few times per day. For blogging journalism, of course.